I'm back!! This past week went by WAY too fast! My husband had the entire week off and I TRULY enjoyed every minute of it with him! 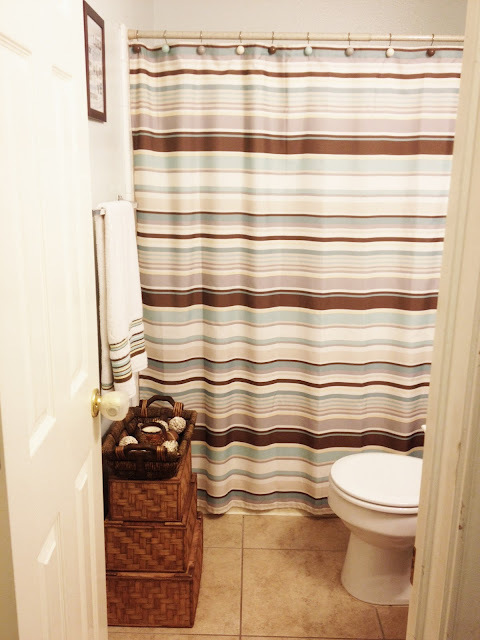 To make up for neglecting my blog last week I am sharing some small updates we recently did to our guest/hallway bathroom. It is not 100% done but it's come a long way! The bathroom color before was very dark and this room has no natural light so it almost seemed like a cave! Please excuse the bad quality of the pics. The old ones were taken with my old iphone (3GS) and the new ones with my new iphone (4S). I don't own a camera so almost all my pictures are taken with my phone, except for a couple where I borrowed my sister's camera. 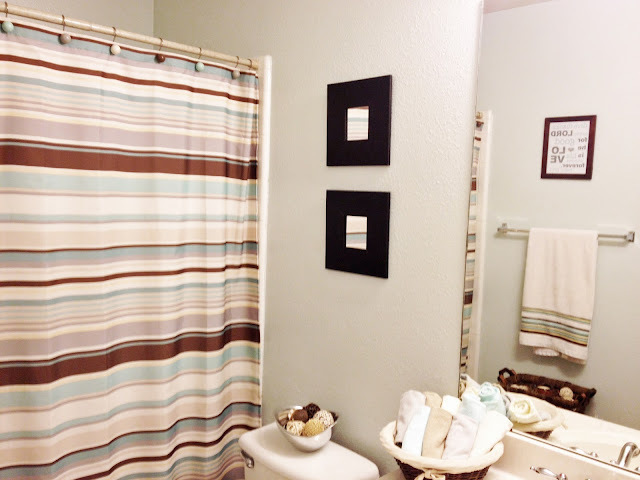 I got the shower curtain from wal-mart a couple years ago. The framed art is the subway art I shared as a freebie here on the blog. take it off and buy a new one but other than that the bathroom is pretty much done. Looks so fresh & pretty! I love the great change! 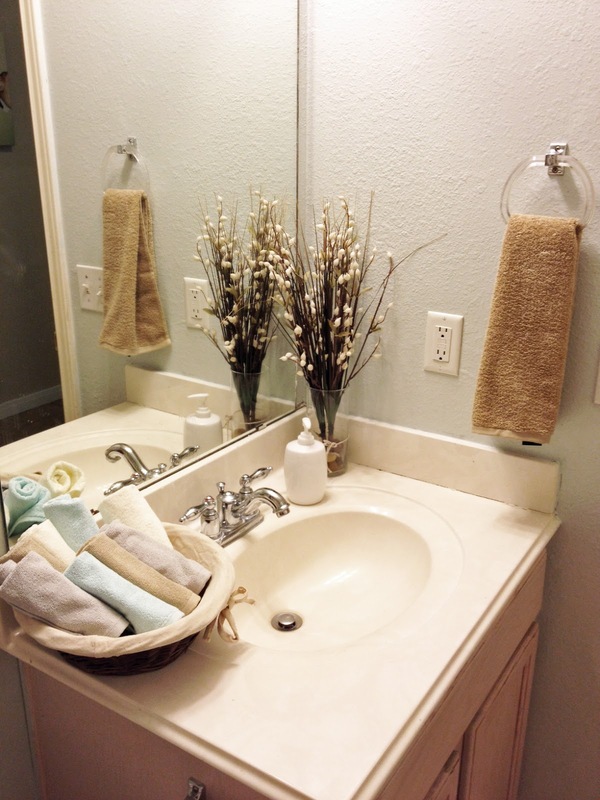 Funny how I posted about my bathroom today as well--we are so on the same page. I love it. You did a great job! It's very tranquil and soothing. It looks gorgeous. I am crazy about stripes, as well as blue & brown combos, so that shower curtain is calling my name! I had a very similar sink cabinet & mirror that I redid during the summer. Here's the link if you're interested! Have a good week! I love it!! So pretty!! 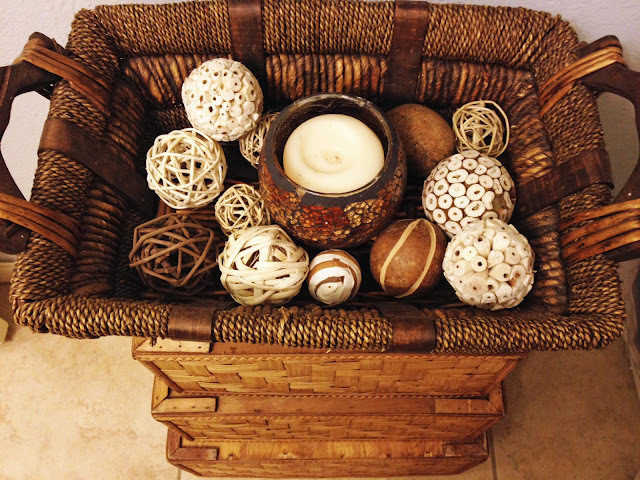 I love how you made that little stand using the upside-down baskets- very ingenious of you!